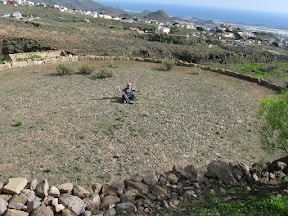 I flew out to Tenerife with my girlfriend, early on Friday morning arriving at Tenerife South at 11:15am. We were dressed for walking on the plane, as we planned to hit the ground running, so to speak. 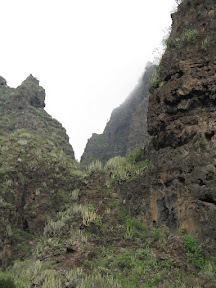 We were booked into Tenerife's most popular walk "Barranco Del Inferno" (Hells' ravine) for 1pm. The walk got so popular a few years ago they put an environmental (erosion) limit of 200 persons per day and introduced at 3 Euro charge per person. By the time we had cleared immigration and collected the rental car, we just had enough time to make it to Adeje for the 1pm start. 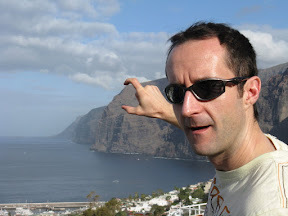 This was to be a gentle introduction for my girlfriend to walking in Tenerife. There is only a couple of hundred metres of ascent in the walk, but it is very picturesque. Here is our route, as recorded by my GPS. We paid our 3 euros, told not to stop in certain areas because of danger of rock fall and sent on our way. It is a 7km out and back route. Strong shoes are recommended, and I agree, but unbelievably I saw people walking in flip-flops. I imagine they regretted that decision. You can see the conditions underfoot below. Here are some photo's en route. If you click on them to enlarge you will be linked to the album where you will see the photo's are all geo-tagged. You can view them on a Google Map within picasa, or click on View Map to see a view of the whole island and it will show you where all of our photo's were taken. I am enjoying this geo-tagging! An idea of the typical path along the route. There are a couple of parts of the route where you clamber over a few rocks, but apart from that it is a very pleasant walk. It took us about 2.5 hours. After that we met my sister (who lives in Tenerife) who gave me the keys to an apartment to use for the weekend. 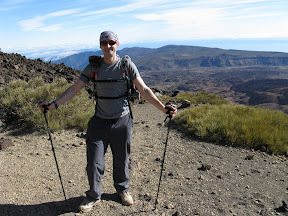 We packed our rucksacks for the following day and got an early night, tired after the early start. 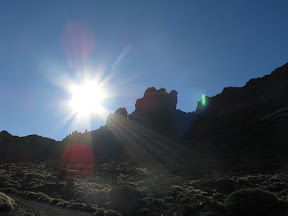 We got up at 06:45am and drove up to the centre of the Island and onto the Plateau (around 2100m) at the foot of Mount Teide. We parked near the Parador hotel and looked up at our first objective for the day, Mount Guajara, towering above us at 2710m. I was trying for a comedy "magazine man" pose, but it turned out too realistic! Here I am posing in front of Mt Guajara itself. You'll notice I am using my walking poles for the first time in years. This is to take some of the strain off my damaged knee, and also to learn to use the poles again in preparation for the Atacama crossing in a couple of month’s time. The weather down on the coast was terrible, but we passed through the cloud layer as we drove up to the plateau and the weather was fine and warm all day long, as you can see here. I made the mistake of not packing a cap or buff, very unusual for me. 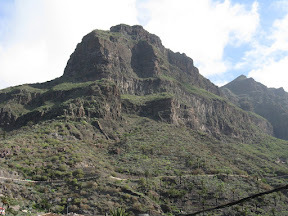 We planned to do a 12 mile circular route, climbing Mount Guajara before heading down towards the Lunar Passage (some lunar-type rock formations) and then heading back to the Parador hotel. 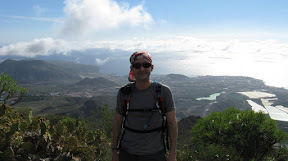 There would be around 1000m of ascent in the route, at least. I had planned the route using some known paths, and then attempting to use Google Earth to fill in the blanks in between. Our planned route is shown below. 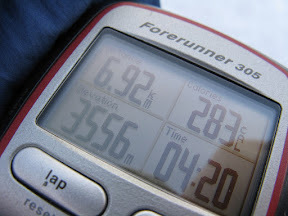 We roughly guessed our pace at 2mph, knowing there would be considerable ascent, and we would be taking photo's and not really rushing. It took about an hour to get the area marked "start of the ascent". 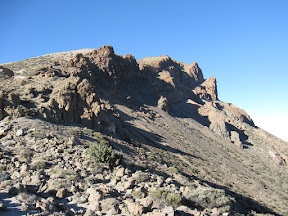 It then took almost 30 minutes to gain the ridge before the sharp right turn to gain the Guajaras top. 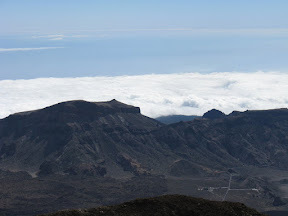 Once up on the ride you get views to the south of Tenerife, and look down on the cloud which is amazing. From that ridge we still had some considerable ascent to do in order to get to the top, as you can see. 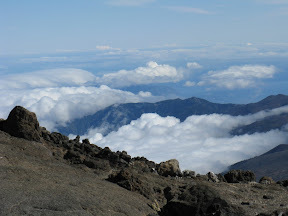 After about 2.5 hours in total we got to the top of Mount Guajaras. We hadn't seen a single person all day, in complete contrast to the walk the previous day where we saw a lot of people. The walking in the centre of the island is not as popular, and route finding can be very difficult with few (if any) paths markings. You have to rely on clues left by other walkers (little cairn piles) to guide you. 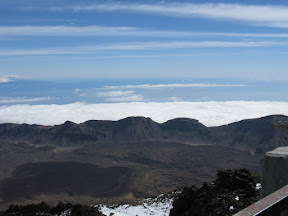 Great views across to the volcano Mount Teide, Spain's highest mountain (3718M). 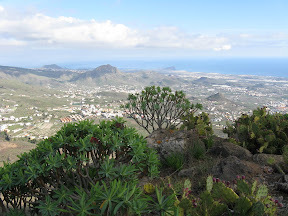 You can see the Parador hotel (where we started the walk) down to the bottom left of the picture. 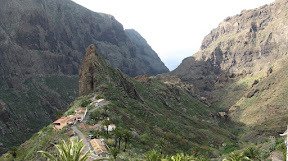 You can also see the hotel at the bottom of this picture of the Roques Garcia. 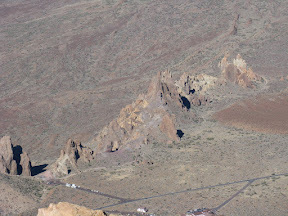 Views across the Las Canadas mountain range (the old crater rim). The sea of cloud below again. We noticed we were only averaging about 1.7mph, and so it would be for the rest of the day. This would put our schedule back, but it couldn't be helped. 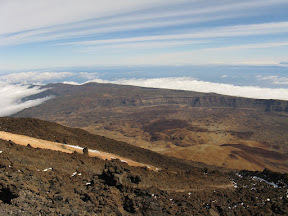 We descent back down to the path at 2500M and turned right, heading for the Lunar Passage. 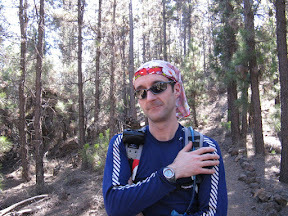 The trails in Tenerife are tough going, they are rough and rubble-filled, so making good time is very difficult. 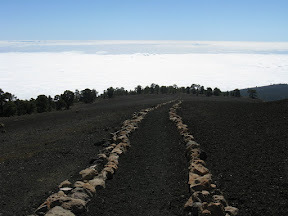 One amazing site (visible from Google Earth) is this straight man-made path that sits atop a volcanic rock formation. The path is about 1km long, and literally in the middle of nowhere. I have no idea who built it, or how long it took? Now, shortly after the end of this path is where it all went wrong. 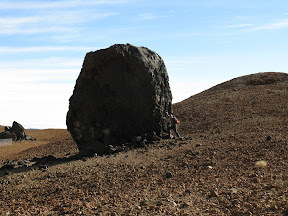 I had tried to estimate a path down to the Lunar rocks before joining an official trail that would take us back to Guajaras, and the car. We began the steep descent on an official trail but always knew that the trail would swing away, so we searched for and found a very faint trail that looked to be heading in the right direction. I was suffering a little from the heat, having not packed a cap, and as a result had used up a large amount of my water. Still we descended down a very steep hill, extremely slowly, slipping and sliding sometimes, but keeping our balance. Ahead we could see the lunar rocks. However, getting down to them was the problem. The almost non-existent trail went down a steep sand bank, and my girlfriend said famously, I'm glad we are going down this and not up. At the bottom we were in a ravine, a currently empty watercourse. I went off ahead confident we could make it the 200M to the lunar rocks and the actual trail again. Just my luck, I came to a stop as the ravine fell away into a sheer 15ft drop, a small plateau and then another 15ft sheer drop. There was no way down. We didn't have ropes, not intending to be doing any climbing. The dark brown area to the right is where that path had the stones either side, as seen in the pics above. The yellow line is our actual route shown. The gradients are grossly out, and everything is vastly steeper than it appears on the map. I then scrambled sharply up the hill to the left of that dead end to see if there was another way around, but again came up against sheer cliffs. We would have to go back the way we came. We ascended the sandy hill and I looked at my GPS for options. We were less than 0.5km from the main trail but seemingly could not reach it because we were too high up. I sat down for a few minutes to rest, feeling pretty ropey due to the heat. I decided to wear my t-Shirt on my head as you can see in my gnome-look below! 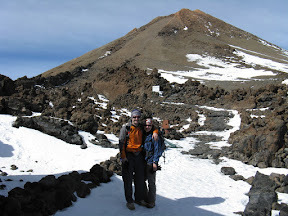 I decided we needed to lose height first and would so have to trek in the opposite direction down a less steep gulley. When nearing the bottom I checked the GPS and decided we needed to head due west exactly for just over 0.5km to get us back on course. I sat down briefly, now with a splitting headache whilst my gf scouted the ground to the west. I headed up after her, but somehow lost my t-shirt headscarf and failed to notice. When I did I wasn't about to go back down and find it, as I was feeling a little too rough. I just wanted to get us back on the trail again. We got to the top of the hill, descended down a ravine and up onto another hill, find a trail, but not 'the trail'. We followed it until it became obvious that it was going the wrong way. I sat down, feeling a little demoralised, and took some time to consider where we needed to be. It was ridiculous. We were less than 200M from the path, but all around was seemingly impossible to climb hills and cliffs in order to reach where we needed to be. We decided there was nothing else for it, we would have to descend steeply into the ravine below us and then scale the hill opposite. We could already see that we would have to do some actual rock climbing though, and I wasn't keen on putting my gf in that position, even though she was happy to do so. We were in the middle of nowhere, and help was a long way off if either of us fell. My gf lent me her buff for my head. You can see a picture of it a little later in this post. I descended into the ravine first, but slipped about 10ft and quite badly grazed my arm, and grazed a few stones into my hand as well. I managed to stop myself before sliding too far, and directed my gf another way. 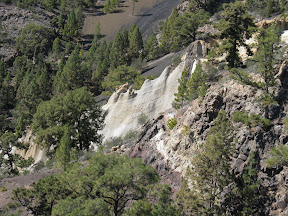 We got to the bottom of the ravine, and looked up to the hill we had to climb. It was probably only 75m altitude gain but all fours scrambling at best, punctuated by small cliff sections which we would have to rock-climb. The rock-climbing bits were made difficult by loose rocks, which made the process pretty scary. I actually forgot to look down. My gf told me afterwards that it was a good idea I hadn't. She had, and it was a long way down if we'd have come off. We got over the worst of the climbing, much to our relief and headed through some thick undergrowth. I was sure the path was less than 100M ahead, according to the GPS. I then heard an accented voice say "Hi you guys", and saw a guy taking a photo of me scrambling up the hill, from 'the path' just 20M ahead. A surge of relief passed over me. 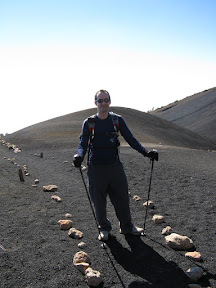 The man was on the main Lunar Passage trail, one that I have been on before. It is very popular, with car parking facility just a few km away. It is also well used by tourists, so we were back in the realms of relative civilization. It is not as though we were ever lost, but getting to point B, from point A was a very tough task. As a result we were now way behind schedule. The wrong route, back-tracking, detours, and climbing meant that we had taken almost 5 hours already. Also, the extra effort from the climbing, combined with the heat (and lack of sunhat) meant that I had used up practically all of my water. I had little more than a few mouthfuls left, for what would be a 5 or 6 mile tough uphill return journey. My gf had 500ml left, which was of course not enough for both of us. I took the decision to follow the main lunar trail back down the dirt road and parking area, and then take a well marked trail back to the town of Vilaflor. The route should have been 4.5km, but we actually clocked it at around 4 miles! It was all downhill, and mostly in forest, and certainly the sensible thing to do. 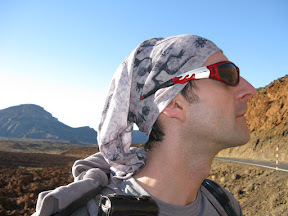 Here is me sporting the "Hello Kitty" buff my gf leant me. Very fetching. The dirt road at start/finish of the Lunar Passage. We did that, had something to eat and drink at a cafe there and got them to call us a taxi to take us back to the Parador. We had covered the intended distance of 12 miles, but just a different route in the end. The whole route is shown below. We then drove back down to the coast through thick cloud. The weather had been raining and poor down there all day, so we did well to stay above it all. 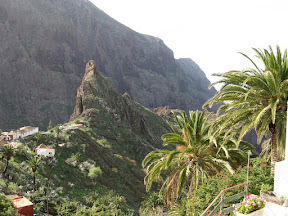 Because the weather was looking changeable we decided not to do the planned ravine walk from the hidden village of Masca down to the beach and back, and instead climb Mount Teide itself. 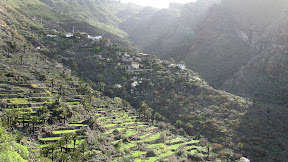 As a consolation here are a few pictures of Masca, which is a stunning area. 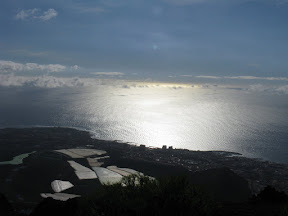 So, the following morning, up at 7am we drove to the centre of the island and parked at the cable car station. En-route I had to refuel the car, and also pick up some nasty 7 euro sunglasses, as I left mine at the apartment. So, you'll have to forgive the comedy sunglasses in the pictures below! We parked up, got our kit on, and set off. 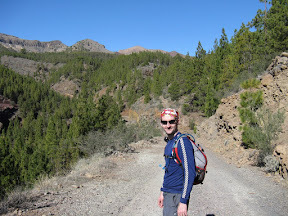 As we were walking around to the official Teide ascent walk, we passed a faint path beside the road which looked to the heading the right direction, was considerably steeper, but would knock about 3 miles off the route. The official route starts with a very dull 2 mile walk up a steady incline dirt road. It takes about 1:45 minutes to reach the start of the ascent proper, using that route (if you park at the cable car station), or about an hour if you park by the start of the dirt road (and are intending to return on foot, and not get the cable car down). 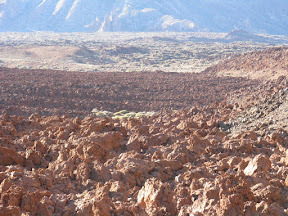 Just opposite the start of this unofficial path we took this shot of the lava fields. Me pondering the unofficial (possibly ‘not allowed’ by the national park authorities either? ), and tricky ascent ahead. Love those comedy flame sunglasses. The faint path is visible before the start of the ascent. 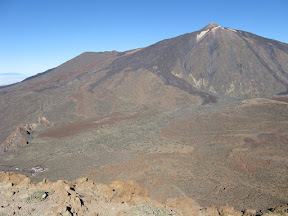 The pictures don't do it justice but to give you an idea, from the road where the path begins (2320m), to the start of the main Teide ascent (2723m) was a 400M altitude gain. As the crow flies it is a 1.45km route, but likely closer to 2km with the zigzagging path. It took us 1 hour and 15 minutes to cover that section, to reach the start of the main ascent. The path all the way up was rubble, and loose. Not recommended for most walkers. Example below. This photo taken looking up at the main ascent, starting from the bottom right of the photo. 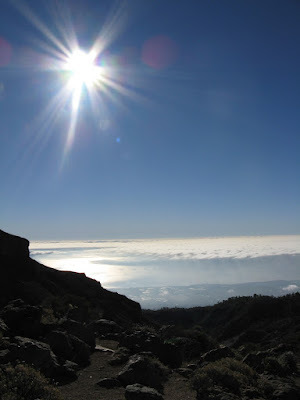 The first hour and 15 minutes of the ascent, to reach the mountain refuge, are straightforward. Just a zigzagging fairly good quality rubble path. There is a small plateau about 20 minutes earlier where these were taken. 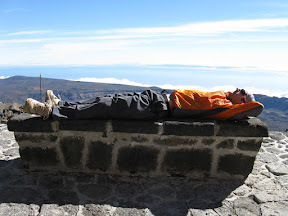 When we reached the mountain refuge we took a well deserved 20 minute rest. Enjoying amazing views over the island. 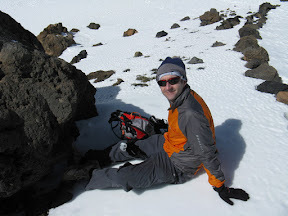 A few people were descending, well kitted out in mountain clothes and, as it transpired... crampons. I asked them in Spanish if access to the peak was possible. They said it was officially closed, but if you had crampons it was possible. 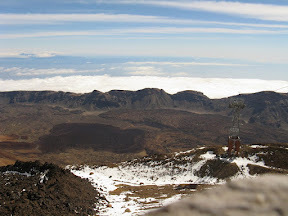 We obviously didn't have crampons, but we would go as far as the top cable car station, or at least try to get that far. The temperature dropped just after the mountain refuge. I put on more clothes. Very quickly rock-hard ice covered the path. Wearing trainers, we were forced to try and tread on rocks beside the path to continue the climb. 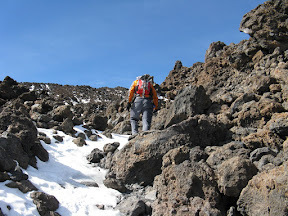 We seriously considered turning back, as we were ill-equipped for ice climbing. Getting higher and colder I put on my gat and gloves. We both struggled, slipped and slided, and prayed that the cable car was open, because descending would have been difficult and dangerous. 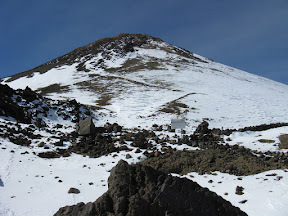 We emerged from the main path into view of the summit cone! We then made our way around the cone to the cable car station. The path we were on was officially closed to those coming up the cable car. A national park rep was waiting for us before the station, checking we were not going to sneak up to the peak (which we wouldn't have done, as we had already been told by email the path was closed. You have to apply to the national park office with your passports for get permits to climb the last 190m anyway), and also to ask how we were getting down. He said something about the police would have a word with the national park reps if we were to descend on foot?? 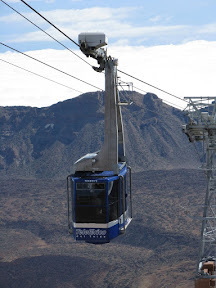 Anyway, we had always intended to ride the cable car down, despite the £12.50 price tag! My gf's Garmin as proof of the height. We then were shepherded into the cable car complex and the gate firmly closed behind us. The Parador hotel 1400M below, and mount Guajaras (the one we climbed the day before) opposite. This is our actual route, which took us a leisurely 4hrs and 20 mins. At the bottom we had some coffee and then headed down towards the coast. 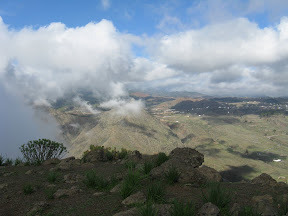 It was abour 3pm, which gave us plenty of time to climb Roque Del Conde, a 1001M peak, starting from 640M plateau. 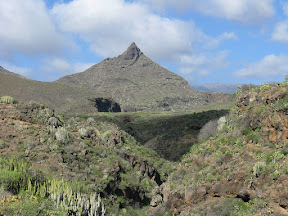 It is also known as Tenerife's table mountain, due to it's distinctive shape. 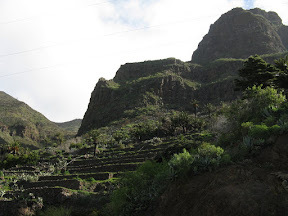 It is covered in agricultural terraces, even the very summit, which takes an hour (at a good pace) to walk up. 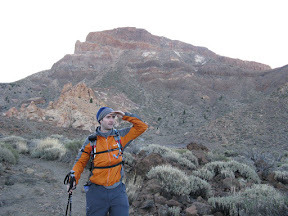 Just after the start we head down into a small ravine and climb out to great views of Roque Imoque. After the ravine is a short section of dirt path before an old abandoned farm house and threshing circle. I thought I'd get in touch with my comedy spiritual side. Straight after, and for the next 20 minutes the path is effectively 'paved'. 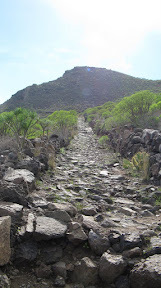 This is the old donkey trail used to bring crops down the mountain. At the top of that section is a false summit, which nevertheless gives great views down to the resorts and banana plantations below. 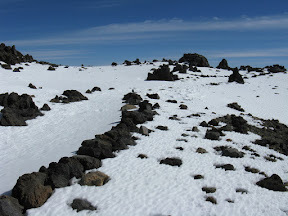 After that the path becomes more challenging, certainly not suitable for those not sure footed. 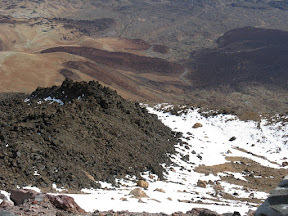 It becomes very steep, and some all-fours scrambling is required to gain the summit. The descent took us a little longer than an hour as my gf's knee was hurting. So, we took our time coming down the steep paths. ...and into the final ravine before the start using the well built path there. and up the other side. That took us through to 6pm, leaving just 40 minutes to sunset. So that concluded our walking adventures for the weekend! The best news: My knee didn't cause me any problems at all when walking. I will possibly try and run once this week and see how I get on. 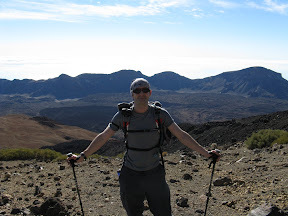 If it seems ok, I will build myself a training plan for the last 2 months before the Atacama Crossing. Hope you enjoyed the pictures. Have a good week. you are completely potty.....but very inspiring; you obviously have a life time of adventures ahead of you; take good care of yourself so that you can enjoy them all. A fellow mountain lover and adventure fiend.